Last month we looked at one of the commercial industries we serve, heavy equipment. 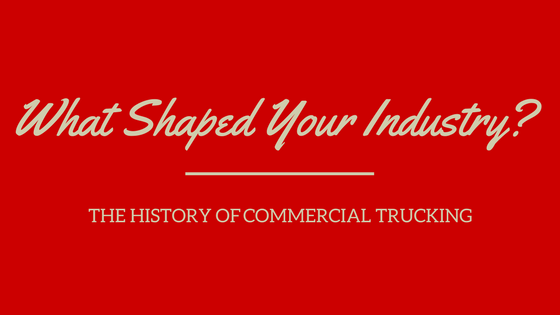 Today we’re going to take a look into the history of commercial trucking, another primary group of dealers we partner with in expanding and optimizing their online marketing. By getting additional insight into the history of these industries, we hope to expand our knowledge in helping to serve you. While I’m no history buff, it’s pretty obvious to conclude that commercial trucking directly evolved from the railroad industry and the need for a more efficient transportation system. Several of my sources all cited 1935 as the birth of this industry, however, this transition of transportation methods came slightly before this. So what happened in 1935? This was the year that the Motor Carrier Act was passed, presenting a set of regulations for all trucks operating on the nation’s highways. This act “established freight-hauling rate regulations, limited the number of hours that truckers were allowed to drive, and oversaw trucking company’s range as well as the type of freight they could carry, according to Random History. While this worried many trucking companies, it was ultimately a huge win for a political war that had ensured for the past decade. The government had invested in the railway system but eventually realized this industry paled in comparison to the innovative trucking industry in terms of flexibility and cost of operation. Throughout World War I there was a vital need for vehicles which grew several trucking companies still around today, including Michigan Motor Freight, Yellow Freight, and Interstate Motor Freight. Of course the need for heavy duty trucks in our military is still very prevalent and capitalized upon today. After World War II, the need for a higher performing engine had presented itself. Direct-injection turbo-charged diesel engines became the new standard in the commercial trucking industry, in large part thanks to Volvo. Truck transmission continued to improve through the 1960’s as trucks aimed to make longer commutes and carry heavier loads. It wasn’t until the 90’s that trucks finally broke out of their commercial mold and started being implemented into the design of personal vehicles. Ford, Chevrolet, and GM saw a rising desire for personal vehicle owners to have more versatility with their vehicles, including number of passengers and storage space. In 1999, the Used Truck Price Crisis hit the industry hard, as the prices of used commercial trucks fell and threatened the economic value of the entire commercial trucking industry, including manufacturers and trucking companies. While there were only 10,000 trucks in the whole country in 1910, today our country sees 15.5 million trucks transporting goods every day, clocking over 400 billion miles per year. Our economy depends on trucks to deliver nearly 70% of all freight transported annually in the U.S., totaling $671 billion worth of manufactured and retail goods.Over the past couple decades, several energy crises have made everyone uneasy, from small business operators to major transportation groups. With the instability of fuel prices, profit margins can fluctuate often for the commercial trucking industry. Sometimes companies end up paying more for the diesel in their trucks than for their drivers. While the need for material goods to be delivered has only increased over time, there has been a huge lack of truck drivers, a job with it’s fair share of disadvantages such as inconvenient work hours and common issues with insomnia. Eventually, as the technology tested in the automobile industry takes hold such as the developments of the Google car, now Waymo, or Tesla’s autopilot, this problem will eventually dissolve with the rise of automated vehicles.